It had been only a year since Marvel had dipped their toes back into events with Acts of Vengeance. Jim Starlin had an idea for another. Ever since he started writing at Marvel, Starlin had been slowly introducing multiple characters and concepts that would all play into a star-spanning high-concept event crammed into only six issues. Thanos had come first from Starlin’s pen. Introduced in the pages of 1973’s Invincible Iron Man #55 (a review of which was posted here), Thanos would eventually grow into a cosmic threat, obsessed with the concept of Death and killing mass amounts of people. Thanos would focus on the Soul Stones, as created by Roy Thomas and Gil Kane for Marvel Premiere #1, and that would become his undoing at the hands of the master of the Soul Gem, Adam Warlock in an adventure featuring the Avengers, Spider-Man, and the Thing. Thanos, despite being turned to stone and presumably dead, didn’t rest for too long. Jim Starlin would bring him back with February 1990’s Silver Surfer #34. Thanos would accompany the Silver Surfer for a time but had ulterior motives covered in a prestige format mini-series called Thanos Quest. There, the mythos of Cosmic Marvel would be significantly expanded upon and introducing the remaining five Soul Gems: Mind, Space, Power, Time, and Reality Gems all joined the Soul Gem. Thanos Quest was short, at only two issues long. However, it is almost required reading for the pending crossover. Throughout 100 pages, Thanos would claw his way through six dangerous quests, one for each of the six Soul Gems. While Thanos is obviously a villain, it’s also awesome to see him take down each opponent with his intelligence and devious nature. Thanos would also rename the six gems into the Infinity Gems, as each provided near-infinite power and only one actually granted the powers of the Soul. In the end, though, Thanos had the power of the Gods, all on the one hand. Finally, the big event was here: The Infinity Gauntlet. 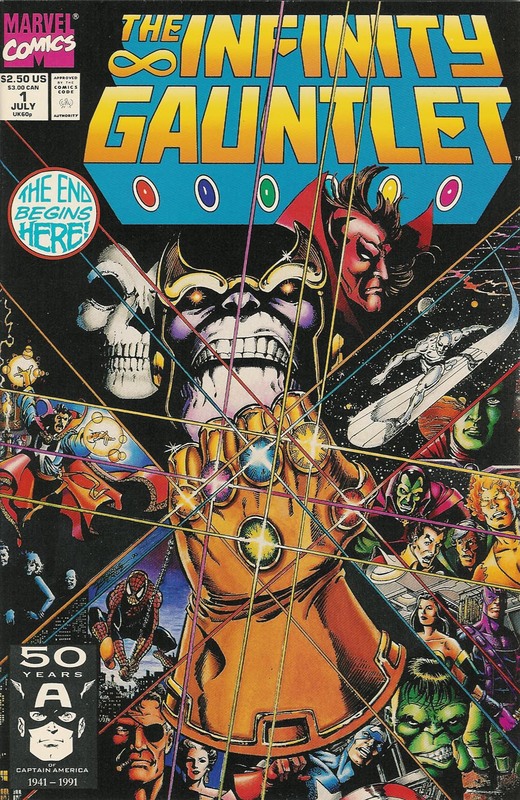 Unlike the events prior, Infinity Gauntlet is a (mostly) self-contained six issue mini-series. However, the results would be incredibly far-reaching. Having assembled all six Infinity Gems, Thanos debates what to do with his near-omnipotence. With Mephisto by his side as an advisor and the personification of Death as his object of affection, Thanos barely takes a chapter before he pulls the trick that caught many audiences off guard in 2018: the Snap. The remaining pages of the first issue are dedicated to people vanishing from the comic far more suddenly than turning to dust. It’s actually genuinely shocking, and the emotion found in dialogue and body language is palpable. What happens next, though, was pretty remarkable for 1991. The entire second issue has the cosmos reeling from Thanos’ actions. Gods meet with other Gods, the Avengers try to rescue those whom they can, and the Earth slowly begins to crumble. Issue three moves to gathering forces against Thanos with Adam Warlock, freshly revived from his long-ago death, meeting with the most popular heroes of 1991. Captain America, Iron Man, Thor, Spider-Man, Doctor Strange, Wolverine, and Cyclops… just to name a few. The tension builds across the entire issue as Thanos is unaware of the heroes gathering. 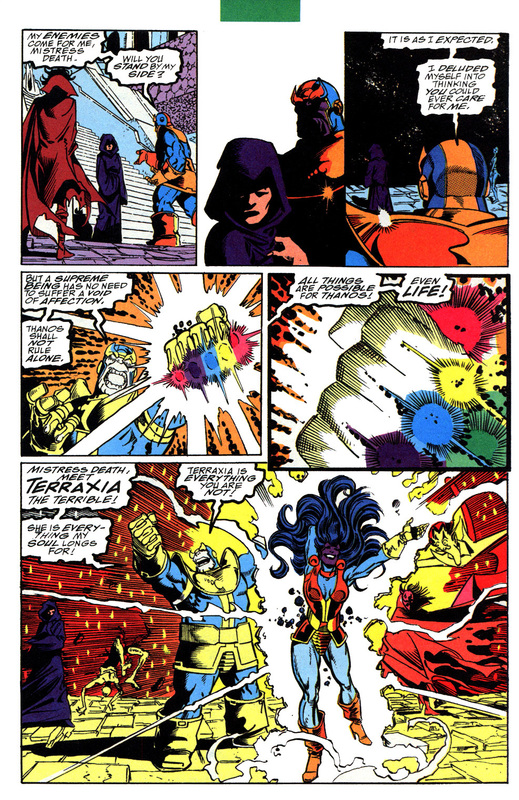 Instead, he attempts to make Death jealous by making his perfect mate: Terraxia. Honestly, seeing how she’s a rule-63 version of Thanos, I’m glad that wasn’t in the movie. I won’t spoil what happens next, but the heroes of Earth and the higher beings of the cosmos try to take the Gauntlet away from Thanos. The stakes keep going higher and higher, with all of creation under threat of becoming under Thanos’ thrall. With each issue of Infinity Gauntlet being double-sized, even the three remaining issues become a roller coaster of thrills, action, and more death than any comic should have been delivering with the Comics Code Authority stamp on the cover. The Infinity Quest and Infinity Gauntlet pairing are some of the best writing that Jim Starlin has ever provided to Marvel. The first set of books easily flesh out Thanos in ways not even Starlin himself had done yet, making him feel like a character who happens to be an omnicidal maniac rather than just a plot device the heroes need to overcome. Many villains are strong, but showing Thanos use his brains to take out six beings who border on the omniscient genuinely backs up the idea of him being a valid threat. Further, Thanos’ pathos as he obtains the powers of God, but somehow still cannot retrieve the object of his desire humanizes the nigh-undefeatable Titan. Sure, the other characters of Marvel exist and are in one of their best collective showings in the 90s, but they all take a backseat to Thanos himself. It winds up getting the really high concept at times and meanders in the last two issues, but Starlin does a fantastic job. Like a lot of events, there’s a ton of people involved with the art. Thanos Quest was drawn by Ron Lim, inked by John Beatty, colored by Tom Vincent, and lettered by Ken Bruzenak. The books are a beautiful piece of art, with some genuinely magical pages that only stand to reinforce the incredible writing from Starlin. It’s a real trip, and worth reading for the art alone. Moving to the Infinity Gauntlet, Ron Lim returns for pencils. Working with him, though, is the legendary George Perez. On inks, we have the trio of Josef Rubinstein, Tom Christopher, and Bruce N Solotoff. Max Scheele and Ian Laughlin work on the colors, and Jack Morelli provides the lettering. While not as experimental at first as Thanos Quest, the amount of scale on display is fantastic. Massive double splash pages are used to significant effect, showing off the emptiness of space or the scope of the attack of recruited heroes on Thanos. As with Thanos Quest, this is one of the best works of the 90s and deserves tons of praise. Aside from the recent movie adapting Thanos Quest and chunks of Infinity Gauntlet, of course, this books left a lasting impression on Marvel. Thanos essentially retired at the end of this tale and would pop back in to be a general menace in the Cosmic Marvel scheme. However, the ending itself would spawn two direct sequels. The Infinity War would feature Marvel’s best-selling heroes fighting twisted doppelgangers of themselves and others for a few months, while The Infinity Crusade would bring the heroes of Marvel into conflict with an evil goddess over the Gauntlet itself. The Infinity Gems themselves would mostly fall into obscurity after those events, though, only resurfacing later in the 90s to have a seventh gem show up: Ego. This gem would be completely forgotten about, and the rest of the gems would fall into disuse until several of Marvel’s more morally-dubious heroes would obtain them to protect the Earth. This would go about as well as you would suspect. The movies would call them Infinity Stones under different colors, and Marvel’s comics would follow suit after a 2015 soft-reboot of the main universe. It’s a long and confusing story, but we’ll get there eventually. The Infinity Gauntlet was one of the bigger things hyped by early 90s Marvel, just with having Thanos return and the earlier release of Thanos Quest. As such, the comic hit some high levels of infamy in the comic reading world. While it only remained within the pages of itself, the sheer ambition and scale of the book demanded attention. The appearance of characters certainly date the book to the early-90s and are the only poorly-aged part of the story. If you can hunt down copies of the original, this is a fantastic book to add to your collection. If you still want to read it, though, there’s a ton of Omnibus releases and digital releases out there for this event. Even if you know of Marvel through the movies, it’s worth checking out. Unlike this event, though, the next one is actually entirely out of print. While not the first crossover between two significant comics publications, it was the first time the audience had a hand in deciding who would win. That’s right, it’s Marvel vs. DC!